Haystack – Page 3 – The revolution may not be televised, but the television will be revolutionised. This story was prompted by my visit to New York to see Christo’s Gates and the subsequent discussions that took place during a most entertaining and enlightening evening at my friends Bob and Ashton’s apartment the night after their party. The party itself had been an epic affair; it started at 2am in a nightclub, moved on to the southern end of Central Park at dawn (where a coffee truck had been organised to dispense much needed refreshment to us party-goers), carried on as we wandered through Christo’s installation in the park, and concluded back at Ashton’s apartment for a truly sumptuous breakfast and other assorted food for thought. Perhaps he was just reiterating the maxim that “property is freedom”, that oldest of capitalist dogmas. Perhaps. In a world where the human genome is in danger of becoming a corporate plaything, where an American company “owns” Basmati rice, where a news channel can claim to “own” the phrase “fair and balanced”, I suspect that Bush meant something greater than just the right to own a home or a car. I may be wrong about his intent, but with this one statement, Bush seemed to me to have declared war on what I shall, for want of a better term, call “the Commons”. Bush appeared to be taunting those who value the Commons – the socialists, “The Left” of yesteryear – who seem to me to have been dealt an ideological knock-out blow by the collapse of the Soviet bloc. The “workers and bosses” rhetoric of that set of ideas was forever tarnished by the toppling of the Berlin Wall. I know that many people would argue that this was not socialism, but it’s almost always perception that counts when it comes to politics. Capitalism now seems triumphant, forging ahead without any coherent opposition. This much, at least, seemed to be the consensus among those of us sitting around the table. So what has become of the dreams of freedom, liberty and autonomy? In terms of land, it was the vision of wide-open spaces and previously-uninhabited land on which to found societies based on idealistic and untested principles that drove the early American settlers eastwards. Today, the entire world has been mapped and accounted for such that we no longer have the possibility of escape. There are no more undiscovered continents, no new territories to settle. So, if we cannot venture into the physical unknown to experiment with new social forms, where do we look for something that we can call an adequate political alternative to the all-conquering capitalist paradigm? I suggested that Christo’s artwork showed us a possible framework for thinking about that elusive goal. 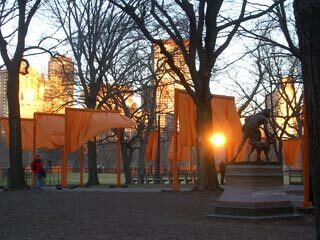 The installation consisted of 7552 orange-coloured gates which lined every single one of the walkways in Central Park. Each gate had a sort of curtain which hung from the crossbar which fluttered as the wind passed through it. To me, this suggested that they were open gates. Furthermore, the gates were placed at regular intervals throughout the park, unless there was the slightest possibility that a gate might interfere with or obstruct the branches of a tree. So then, having been granted permission to construct the artwork (after 25 years of trying to persuade the authorities to let him do it) the only force that prevented a gate from being placed across a path was the artist’s deference to nature. This was reinforced by the way in which each gate was seated on a soft material base which ensured that the installation would leave no physical trace of its presence once it was removed. The physicality of the installation (or lack of it) was reinforced in what I read about the way in which the project had come into being. The New York authorities had paid nothing for the installation – it was entirely financed from the sale of Christo’s drawings. Visitors weren’t required to pay to get in, nor could they (or anyone) buy a piece of the artwork – all the materials that were used have subsequently been recycled. Indeed, all the proceeds from the marketing devices (such as brochures, postcards, books and so on) have gone to a charity devoted to preserving and extending New York’s wildlife. So then, it seems as though the city paid nothing, visitors paid nothing and even the artist gained nothing from the artwork. Financial transactions had effectively been removed from the equation. But to what end? What was Christo suggesting by the way in which the project had been configured? My first conclusion was based more on the hype surrounding the installation than the installation itself; that for two precious weeks The Gates had made the park more important than the city itself. I was astounded by this remarkable achievement, particularly when I considered the recent history of the city. As I marvelled at the impact and ephemerality of the project, the thought occurred to me that Central Park is also as close to “common land” as it gets in New York. The installation was on that common land, suggesting to me that, in a sense, Christo’s open gates symbolised access – access to the commons. A few weeks ago I was helping some friends out with their home computer system. Phil and Sophie have two Macintosh computers, one of which was Sophie’s primary working machine, but which has since been relegated to a secondary role when she bought a snazzy new one. She still wanted to use the old one for checking her graphic designs out on a cathode ray tube monitor because her new machine has a flat screen display (don’t ask – it’s a designer thing!) but also wanted to give Phil the ability to use the machine for his own purposes. I suggested something that she had not explored: multiple user accounts. Prior to my tinkering, Sophie’s computer had always booted straight to the desktop, so that as soon as she switched it on, it would be ready for her to start work. As soon I had implemented the multiple user feature, it became apparent to both of them that this was exactly what they were looking for and moreover what a fine idea user accounts were. Both of them could use the machine as if it were theirs’ alone. However, now that Sophie needed to log in to the machine in order to use it, she became somewhat agitated and uneasy. She gave the matter some thought and explained to me that she felt as though the computer was no longer hers. I could see her point – in reconfiguring it so that both of them could use it, she had apparently traded “ownership” for “access”. My point is that computing is rapidly converging on a paradigm that gives access precedence over ownership. This is happening in many different ways: from open source software and community networks such as consume.net or bristolwireless.net to the internet itself – owned by no-one yet immensely useful to everyone who has access. Think of a networked bazaar rather than a centralised and hierarchical cathedral. This focus on access is perhaps not new (I’m sure someone can find precedents – I myself would point to Bakunin’s assertion that “property is theft”) but it does not figure in “old-school” socialism as far as I can tell – that paradigm held that all property was property of the state. This effectively amounted to property being held in common, but only if the state was truly an organisation belonging to the people… something that was clearly not the case in practice. I suggested that these technologies are, in the absence of a commonly-held physical space, our new “Commons”. Even when the entire surface of the Earth has been registered, mapped, bought, sold and defended, these virtual spaces will still remain common to us all – as long as we have the equipment to access them. They may even correspond to a third definition of property (derived from the Sufis amongst others) which holds that “property is impossible” and that one only truly “owns” the things that one cannot lose in a shipwreck. Think skills, knowledge, experience rather than iPods, cars and houses. In this respect, I think Christo has done something quite remarkable. The Gates cannot be owned, cannot therefore be “property” in the conventional sense. This art could only be accessed, experienced and thought about. He placed a coded non-capitalist statement [Aside: I have not written ‘anti-capitalist’ because I sense that what is sought is the transcendence of capitalism rather than its defeat] slap-bang in the middle of the city which, for many people, embodies the capitalist spirit. Moreover, he sought not to erect something of permanence, but made the installation time-bound and temporary, signaling that autonomy may be achieved, but only for a short while before it disperses and recombines to appear elsewhere in another form. This is the principle of the Temporary Autonomous Zone (TAZ) which Hakim Bey describes so eloquently. 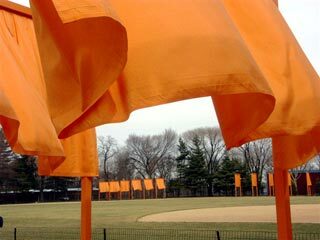 I won’t try to paraphrase or restate the theory, you can read it for yourself, but consider the reaction of the people to Christo’s work: New Yorkers promenaded through the park, looking around, chatting to people and, in my experience, for the most part smiling. Let’s not forget these are New Yorkers I’m talking about here… this is distinctly unusual behaviour. For a brief, beautiful moment in time, people transcended their differences and found their common humanity. Last week, I visited Christo’s latest artwork, The Gates, in New York’s Central Park, and went to a party some friends were throwing to celebrate the arrival of the installation. The scrap of material was handed to me by one of the workers whom I approached after a discussion with my friends, where I asked, half-joking, whether it would be legitimate to restore any of the “curtains” to their original free-hanging state if they accidentally became wrapped around the crossbar by a gust of wind or a wild flap. It turned out that it was this (paid, as it turns out) worker’s job to do just that – answering my question conclusively. While we were talking to her, much to our surprise and delight, she reached into a pouch and brought out some swatches of the material for everyone in our group. 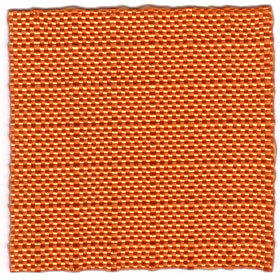 I later learned that Christo had ordered a million of these samples for curious visitors, so they are hardly rare. But, as I found out trying to scan and colour-correct the one above, the fabric seems to contain a variety of colours as it shimmers in the light. It will remind me – more vividly than a photo ever could – of a glorious, epic weekend in the park. If you have any thoughts about the Gates, visit the Gates Memory Project blog and contribute to The Gates: An Experiment in Collective Memory, which “will be online and constantly evolving according to the contributions, suggestions and innovations of participants”. 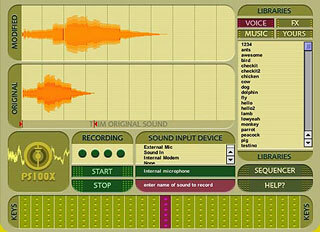 This page describes the process of creating a cross-platform Director CDROM. It is based on an original posting on Direct-L by Kevin M. Dean at Rhubarb Productions. I have amended it for eCD creation and updating existing CD setups. Please email me if you have any comments or suggestions about the instructions on this page, and I will include them in the next revision. Thanks. These instructions follow on from the Macromedia technote on creating a proper bundle and it’s assumed you’ve already got that straightened out and have pasted icons onto the classic, OS X, Classic alias, and .app projector bundle files. Pasting the icons should work fine for all of those under OS X and look correct under OS 9 as long as you’ve created OS 9 / OS X compatible icons (easily done by using IconBuilderPro in Photoshop). If you want to set an OS X picture background for your finder window, here’s how to set it up and keep the source files hidden under both OS X and OS 9. Go to the folder that you’ve set up as the source for your cd structure. We’ll call it “CD Folder” for explanation purposes. At this point you may only have your “projector.app” listed there unless you have other structure in place. Create a folder. Let’s call it “background”. Place the image you want to use in this folder. We place the picture here so it will be contained on the cd when linked. Otherwise your source machine will be the only machine to see the picture if you link it from a different volume. Best way to check as usual is to mount the final cd on another computer when testing. Now it’s time to make the background folder disappear. Open the Terminal and type “cd ” (Note that there is a space after cd) and drag your “CDFolder” icon from your desktop into the terminal window. This should complete the path to your folder. Hit Return. Type “mv background .background” and hit return. This sets the folder to invisible under OS X and OS 9. So the next time you browse into your folder you should no longer see the “background” folder. Note that there is a later step that requires Default Folder X or an app with similar described functionality (eg TinkerTool), so if you don’t have it don’t use the terminal command to make the folder invisible, but I highly recommend it to keep everything nice and clean. Now our files are in place and ready to go. Restart your computer and boot into OS 9. Open Disk Copy. Create an image from a folder and select your “CD Folder” and set it to read/write. We do this under OS 9 to create a .img file instead of OS X’s .dmg file which are not compatible with OS 9. After the image is created and mounted, copy your “projector.app” icon and paste it on the mounted volume. Position your open finder window and app icon like you wish it to look for OS 9. When positioning the window remember to place it somewhere in the upper left corner of your screen so that it’s compatible with smaller screen resolutions. Otherwise if you have a large screen and place it down and to the right it may appear partially off the edges of the screen on smaller resolutions. Right-click your “projector.app” and select “show package contents”. Set the resulting finder window and Classic projector alias to look like you want. We do this so older systems that do not support application bundles will still look nice. You may just want to hide the “contents” folder (which should be in your bundle) outside the visible portion of the window. I haven’t experimented to see if setting the “contents” folder to be invisible has any adverse effects on the application bundle so I’m not recommending it at this time. Close the 2nd window. Right-click on your “projector.app” again and select “hide package contents”. We do this because your Classic app will not launch properly from the “projector.app” if we didn’t. Now, leaving the window open and positioned how you like, unmount the image. Restart into OS X. Mount the disk image you created. Copy your “projector.app” icon and paste it on the mounted volume. For the disk image’s window set your view to Icons (Command-1). Select “Hide Toolbar” (Command-B). Select “Show View Options” (Command-J). Size your icon and position it to how you’d like it. Great use for those 128×128 icons with transparency. (If you’ve planned ahead you have an icon position and size in mind for how it sits over your window background picture). At the bottom of the view options window you’ll see “Background: White, Color, Picture”. Select Picture and then press the “Select…” button while holding down the option key which via Default Folder X will allow you to see invisible files in the dialog box. Browse to your mounted disk volume and select the picture you placed in the “.background” folder. Seeing invisible files is that crucial functionality that required Default Folder X that I had mentioned previously. Now you might say… why don’t we just make the folder invisible by renaming it to “.background” after we link the picture on the mounted disc image so we don’t need Default Folder X. This does work but unfortunately the “.background” folder would be visible on the OS 9 side at that point whereas our method from above does not show under OS 9. Now position the window on the screen remembering to place it in the upper left like noted for the OS 9 side. Use the application AutoOpen to save the position so it actually works when you mount the final cd by dragging your mounted disk volume into AutoOpen’s window and selecting “Apply Action”. You can confirm that everything is working by unmounting and remounting the image. The window should automatically open in the position you’ve set with all of the other tweaks you’ve made. Note that you should NOT remount this image at this point under OS 9 again without knowing that you’ll have to reset your AutoOpen under OS X again. For some reason simply mounting the image in OS 9 destroys its settings, but rest assured you don’t lose any of your OS 9 settings when working with it in OS X. At this point we have a disk image that’s ready to populate with content. One of the limitations that I’ve found is that the original size of the Mac OS9 disk image is crucial to the content addition step. It seems as though creating a disk image limits the amount of data that can be added. So, a 100Mb disk image will never accept more than 100Mb of data. However, Toast seems intelligent enough to shrink the amount of CD real estate used in the burn process to exactly the size of the content that *is* used. Consequently, I recommend making a full size disk image in the first place (ie 700Mb) and using that as the template for the content-adding stage, otherwise the above process will have to be repeated each time the content of a CD exceeds the size of the initial disk image capacity. So, mount the disk image in OSX and right-click on the package, choose Show Package Contents and navigate down the directories until you get to the “data” directory. This is *your* “content” folder (rather than the bundle’s own “Content” folder). You can now replace this with your folders containing the your content, assuming you’ve gone with the generic stub projector route as described in MM’s technote. Your now ready to go with your usual Toast CD-burning process. If you already have a prexisting Toast CD description file, and you want to amend it, then this sections descibes how to do that. I assume that this is the point you want to start each configuration process once you have replaced the content in a duplicate of an existing eCD disk image. Mount the disk image (or make sure it is already mounted from the previous process) and open the Toast file which refers to the CD you want to create. Because Toast does not pick up that the content has changed, you will have to delete the references to the old “data” folder on the Mac side and drag the data folder in to the Toast window again. At this point, Toast will update its description of the disk image. It may be that you have to drill down through the directories in the Toast window removing .DSStore files, although I have yet to test whether they show up on OS9 or Windows. If they don’t then this step can be omitted, but I have assumed so far that they do need to be removed. Select the PC side of the disk, and remove the existing “data” folder and repeat the process of dragging the updated folder on the disk image to the PC side. This updates the description of the CD. Now it should be ready to burn so leave the disk image mounted as a volume and launch Toast. These steps you’re probably already familiar with but I’ll go throught them just in case. Select Other and then Custom Hybrid. Select Mac… and choose your mounted volume. (Note: at this point you should make sure the window that you want to appear by default is open – otherwise it may not open even though you have set it to do so with AutoOpen) Select ISO… and pick your windows source folder. If the is no additional CD content, then drag the “data” folder from inside the OSX package to the Windows side of the disk and add it to the folder containing the PC executable. I recommend at this point saving as a disk image (Command-B) So you can create a final master file that will be much easier to go back to later if you need to burn more. Now you can burn away and if we’ve done everything correctly your mounted cd should do everything we’ve configured it for. I can highly recommend an addition to this approach: create a temporary partition for the PC side as well. If you do this before you start building your CD you will end up with two image files, which can be mounted on any machine and burned without fear of anything breaking. Save the toast setup file on the PC partition, but don’t include it in the disc build, and you’ll just be able to mount the two images, double click the setup file and hit burn. This makes it perfect for archiving off, and makes it REALLY easy to make small amends and reburn without having to set everything up again. If you don’t, then you’ll find that if you open up the setup file, it will usually have lost links to the original files for the PC side because you’re on a different Mac, you renamed your HD, moved/deleted/backed up the source files etc.